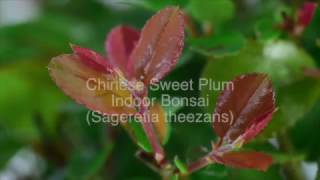 A beautfiul S-Shaped Sweet Plum (Sageretia theezans) ideal for your desk or windowsill. This bonsai has a wonderful canopy of perfectly proportioned leaves on an elegant and shapely trunk. Fun to prune and ideal for beginners. One of our favourites, this lovely mid-sized bonsai tree has great foliage colour and pretty purple fruits. Potted into a mid-blue ceramic bonsai pot for a classic bonsai appearance. Ideal size bonsai for window sill or desk. Perfectly proportioned leaves, a lovely S-Shaped trunk and great character throughout. This is an outstanding bonsai; one of my favourites. The larger size makes it easier to care for and the lovely red tints to the new foliage are beautiful. This bonsai has great character, a lovely twisty shape and is great for beginners.